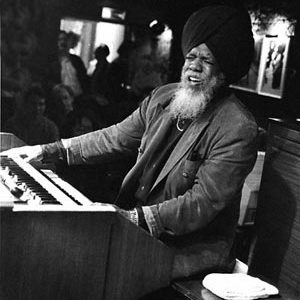 Dr. Lonnie Smith (not to be confused with Lonnie Liston Smith) was born in born born July 3, 1942 in Lackawanna, New York His affinity for R&B melded with his own personal style, and he quickly became a local legend. He moved to New York City, where he met George Benson, the guitarist for Jack McDuff's band. Benson and Smith connected on a personal level, and the two formed the George Benson Quartet featuring Lonnie Smith in 1966. After two albums (It's Uptown and Cookbook), Smith recorded his first solo album (Finger Lickin' Good) in 1967, with George Benson on guitar, Ronnie Cuber on bass, Melvin Sparks and Marion Booker on drums. This combination remained stable for the next five years. In 1967, Smith met Lou Donaldson, who put him in contact with Blue Note Records. Donaldson asked the quartet to record an album for Blue Note, Alligator Boogaloo. Blue Note was so impressed by the album that they signed Smith for the next four albums, all of which are now considered classics of soul jazz. This highly influential period produced Think (with Melvin Sparks, Marion Booker, Lee Morgan and David Newman) and Turning Point (with Lee Morgan, Benny Maupin, Melvin Sparks and Idris Muhammed). The latter is largely regarded as his most seminal studio album. Smith toured the Northeastern United States heavily during this period, proving himself to be one of New York's finest musicians. He concentrated largely on smaller neighborhood venues during this period, playing SRO shows that boosted his credibility and allowed him to develop his style more intimately in front of his audience. His sidemen included Ronnie Cuber, Dave Hubbard, Bill Easley and George Adams on sax, Donald Hahn on trumpet, George Benson and Larry McGee on guitars, and Joe Dukes, Sylvester Goshay, Phillip Terrell, Marion Booker, Jimmy Lovelace, Charles Crosby, Art Gore, Norman Conners and Bobby Durham on drums. Smith's next album Move Your Hand was recorded at the Club Harlem in Atlantic City, New Jersey in August of 1969. This surprise hit spread allowed his reputation to grow beyond the Northeast. He would record another studio album Drives and one more live album Live at Club Mozambique before leaving Blue Note. Live at Club Mozambique was recorded in Detroit on 21 May 1970, and is considered to be his finest live recording. When The Night Is Right!